A Christmas tree is a decorated tree, usually an evergreen conifer such as spruce, pine, or fir or an artificial tree of similar appearance, associated with the celebration of Christmas. The modern Christmas tree was developed in early modern Germany (where it is today called Weihnachtsbaum or Christbaum), in which devout Christians brought decorated trees into their homes. It acquired popularity beyond the Lutheran areas of Germany, during the second half of the 19th century, at first among the upper classes. The tree was traditionally decorated with "roses made of colored paper, apples, wafers, tinsel, [and] sweetmeats". In the 18th century, it began to be illuminated by candles which were ultimately replaced by Christmas lights after the advent of electrification. Today, there is a wide variety of traditional ornaments, such as garlands, baubles, tinsel, and candy canes. An angel or star might be placed at the top of the tree to represent the archangel Gabriel or the Star of Bethlehem from the Nativity. Edible items such as gingerbread, chocolate and other sweets are also popular, and are tied to or hung from the tree's branches with ribbons. The Christmas tree is sometimes compared with the "Yule-tree", especially in discussions of its folkloric origins. The relevance of ancient pre-Christian customs to the 16th Century German initiation of the Christmas tree custom is disputed. Resistance to the custom was often because of its confirmed Lutheran origins. Other sources have tried to make a connection between the first documented Christmas trees in Alsace around 1600 and pre-Christian traditions. For example, according to the Encyclopædia Britannica, "The use of evergreen trees, wreaths, and garlands to symbolize eternal life was a custom of the ancient Egyptians, Chinese, and Hebrews. Tree worship was common among the pagan Europeans and survived their conversion to Christianity in the Scandinavian customs of decorating the house and barn with evergreens at the New Year to scare away the devil and of setting up a tree for the birds during Christmas time." During the Roman mid-winter festival of Saturnalia, houses were decorated with wreaths of evergreen plants, along with other antecedent customs now associated with Christmas. The first recorded Christmas tree can be found on the keystone sculpture of a private home in Turckheim, Alsace (then part of Germany, today France), dating 1576. The Georgians have their own traditional Christmas tree called Chichilaki, made from dried up hazelnut or walnut branches that are shaped to form a small coniferous tree. These pale-colored ornaments differ in height from 20 cm (7.9 in) to 3 meters (9.8 feet). Chichilakis are most common in the Guria and Samegrelo regions of Georgia near the Black Sea, but they can also be found in some stores around the capital of Tbilisi. Georgians believe that Chichilaki resembles the famous beard of St. Basil the Great, who is thought to visit people during Christmas similar to the Santa Claus tradition. In the late eighteenth and early nineteenth century, these traditions were almost completely replaced by the German custom of decorating the Christmas tree. Customs of erecting decorated trees in wintertime can be traced to Christmas celebrations in Renaissance-era guilds in Northern Germany and Livonia. The first evidence of decorated trees associated with Christmas Day are trees in guildhalls decorated with sweets to be enjoyed by the apprentices and children. In Livonia (present-day Estonia and Latvia), in 1441, 1442, 1510 and 1514, the Brotherhood of Blackheads erected a tree for the holidays in their guild houses in Reval (now Tallinn) and Riga. On the last night of the celebrations leading up to the holidays, the tree was taken to the Town Hall Square where the members of the brotherhood danced around it. A Bremen guild chronicle of 1570 reports that a small tree decorated with "apples, nuts, dates, pretzels and paper flowers" was erected in the guild-house for the benefit of the guild members' children, who collected the dainties on Christmas Day. In 1584, the pastor and chronicler Balthasar Russow in his Chronica der Provinz Lyfflandt (1584) wrote of an established tradition of setting up a decorated spruce at the market square where the young men "went with a flock of maidens and women, first sang and danced there and then set the tree aflame". 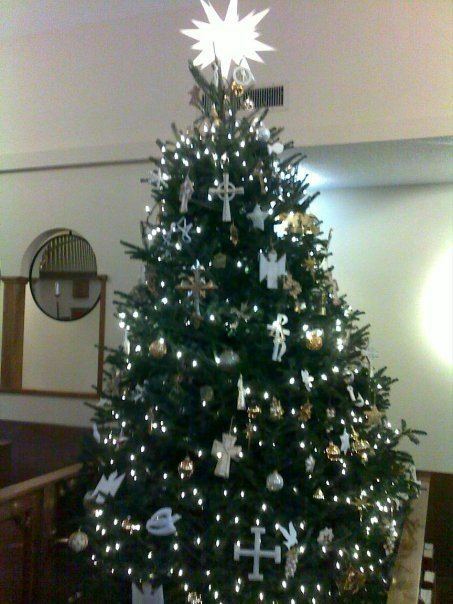 After the Protestant Reformation, such trees are seen in the houses of upper-class Protestant families as a counterpart to the Catholic Christmas cribs. This transition from the guild hall to the bourgeois family homes in the Protestant parts of Germany ultimately gives rise to the modern tradition as it developed in the 18th and 19th centuries. By the early 18th century, the custom had become common in towns of the upper Rhineland, but it had not yet spread to rural areas. Wax candles, expensive items at the time, are found in attestations from the late 18th century. In the 19th century, the Christmas tree was taken to be an expression of German culture and of Gemütlichkeit, especially among emigrants overseas. A decisive factor in winning general popularity was the German army's decision to place Christmas trees in its barracks and military hospitals during the Franco-Prussian War. Only at the start of the 20th century did Christmas trees appear inside churches, this time in a new brightly lit form. After Victoria's marriage to her German cousin Prince Albert, by 1841 the custom became even more widespread as wealthier middle-class families followed the fashion. In 1842 a newspaper advert for Christmas trees makes clear their smart cachet, German origins and association with children and gift-giving. An illustrated book, The Christmas Tree, describing their use and origins in detail, was on sale in December 1844. In 1847, Prince Albert wrote: "I must now seek in the children an echo of what Ernest [his brother] and I were in the old time, of what we felt and thought; and their delight in the Christmas-trees is not less than ours used to be". A boost to the trend was given in 1848 when The Illustrated London News, in a report picked up by other papers, described the trees in Windsor Castle in detail and showed the main tree, surrounded by the royal family, on its cover. In fewer than ten years their use in better-off homes was widespread. By 1856 a northern provincial newspaper contained an advert alluding casually to them, as well as reporting the accidental death of a woman whose dress caught fire as she lit the tapers on a Christmas tree. They had not yet spread down the social scale though, as a report from Berlin in 1858 contrasts the situation there where "Every family has its own" with that of Britain, where Christmas trees were still the preserve of the wealthy or the "romantic". Their use at public entertainments, charity bazaars and in hospitals made them increasingly familiar however, and in 1906 a charity was set up specifically to ensure even poor children in London slums 'who had never seen a Christmas tree' would enjoy one that year. Anti-German sentiment after World War I briefly reduced their popularity but the effect was short-lived and by the mid-1920s the use of Christmas trees had spread to all classes. In 1933 a restriction on the importation of foreign trees led to the 'rapid growth of a new industry' as the growing of Christmas trees within Britain became commercially viable due to the size of demand. By 2013 the number of trees grown in Britain for the Christmas market was approximately 8 million and their display in homes, shops and public spaces a normal part of the Christmas season. The Christmas tree became very common in the United States in the early nineteenth century. The first image of a Christmas tree was published in 1836 as the frontispiece to The Stranger's Gift by Hermann Bokum. The first mention of the Christmas tree in American literature was in a story in the 1836 edition of The Token and Atlantic Souvenir, titled "New Year's Day," by Catherine Maria Sedgwick, where she tells the story of a German maid decorating her mistress's tree. Also, a woodcut of the British Royal family with their Christmas tree at Windsor Castle, initially published in The Illustrated London News December 1848, was copied in the United States at Christmas 1850, in Godey's Lady's Book. Godey's copied it exactly, except for the removal of the Queen's tiara and Prince Albert's moustache, to remake the engraving into an American scene. The republished Godey's image became the first widely circulated picture of a decorated evergreen Christmas tree in America. Art historian Karal Ann Marling called Prince Albert and Queen Victoria, shorn of their royal trappings, "the first influential American Christmas tree". Folk-culture historian Alfred Lewis Shoemaker states, "In all of America there was no more important medium in spreading the Christmas tree in the decade 1850–60 than Godey's Lady's Book". The image was reprinted in 1860, and by the 1870s, putting up a Christmas tree had become even more common in America. When Edward H. Johnson was vice president of the Edison Electric Light Company, a predecessor of Con Edison, he created the first known electrically illuminated Christmas tree at his home in New York City in 1882. Johnson became the "Father of Electric Christmas Tree Lights". The lyrics sung in the United States to the German tune O Tannenbaum begin "O Christmas tree...", giving rise to the mistaken idea that the German word Tannenbaum (fir tree) means "Christmas tree", the German word for which is instead Weihnachtsbaum. In Russia, the Christmas tree was banned after the October Revolution but then reinstated as a New-year spruce (Новогодняя ёлка, Novogodnyaya yolka) in 1935. It became a fully secular icon of the New Year holiday, for example, the crowning star was regarded not as a symbol of Bethlehem Star, but as the Red star. Decorations, such as figurines of airplanes, bicycles, space rockets, cosmonauts, and characters of Russian fairy tales, were produced. This tradition persists after the fall of the USSR, with the New Year holiday outweighing the Christmas (7 January) for a wide majority of Russian people. Since the early 20th century, it has become common in many cities, towns, and department stores to put up public Christmas trees outdoors, such as the Macy's Great Tree in Atlanta (since 1948), the Rockefeller Center Christmas Tree in New York City, and the large Christmas tree at Victoria Square in Adelaide. The use of fire retardant allows many indoor public areas to place real trees and be compliant with code. Licensed applicants of fire retardant solution spray the tree, tag the tree, and provide a certificate for inspection. Real trees are popular with high end visual merchandising displays around the world. Leading global retailers such as Apple often place real trees in their window displays. In 2009, Apple placed two Fraser fir trees in every one of its retail establishments. The United States' National Christmas Tree has been lit each year since 1923 on the South Lawn of the White House. Today, the lighting of the National Christmas Tree is part of what has become a major holiday event at the White House. President Jimmy Carter lit only the crowning star atop the tree in 1979 in honor of the Americans being held hostage in Iran. The same was true in 1980, except that the tree was fully lit for 417 seconds, one second for each day the hostages had been in captivity. In some cities, a Festival of Trees is organized around the decoration and display of multiple trees as charity events. The giving of Christmas trees has also often been associated with the end of hostilities. After the signing of the Armistice in 1918 the city of Manchester sent a tree, and £500 to buy chocolate and cakes, for the children of the much-bombarded town of Lille in northern France. In some cases the trees represent special commemorative gifts, such as in Trafalgar Square in London, where the City of Oslo, Norway presents a tree to the people of London as a token of appreciation for the British support of Norwegian resistance during the Second World War; in Boston, where the tree is a gift from the province of Nova Scotia, in thanks for rapid deployment of supplies and rescuers to the 1917 ammunition ship explosion that leveled the city of Halifax; and in Newcastle upon Tyne, where the main civic Christmas tree is an annual gift from the city of Bergen, in thanks for the part played by soldiers from Newcastle in liberating Bergen from Nazi occupation. Norway also annually gifts a Christmas tree to Washington, D.C. as a symbol of friendship between Norway and the US and as an expression of gratitude from Norway for the help received from the US during World War II. A "Chrismon tree" is a Christmas tree decorated with explicitly Christian symbols in white and gold. First introduced by North American Lutherans in 1957, the practice has rapidly spread to other Christian denominations, including Anglicans, Catholics, Methodists, and the Reformed. "Chrismon" (plural "Chrismons") was adopted for the type of Christmas decoration and explained as a portmanteau of "CHRISt-MONOgram" (a Christogram). In many areas, it has become customary to set up one's Christmas tree at the beginning of the Advent season. Some families in the U.S. and Canada will put up a Christmas tree a week prior to American Thanksgiving (the fourth Thursday of November), and Christmas decorations can show up even earlier in retail stores, often the day after Halloween (31 October). In Canada many families wait until after Remembrance Day, as to show respect to fallen soldiers. Some households do not put up the tree until the second week of December, and leave it up until 6 January (Epiphany). In Germany, traditionally the tree is put up on 24 December and taken down on 7 January, though many start one or two weeks earlier, and in Roman Catholic homes the tree may be kept until February 2 (Candlemas). In Italy and Argentina, along with many countries in Latin America, the Christmas tree is put up on 8 December (Immaculate Conception day) and left up until 6 January. In Australia, the Christmas tree is usually put up on 1 December, which occurs about a 2 weeks before the school summer holidays (except for South Australia, where most people put up their tree after in late November following the completion of the Adelaide Christmas Pageant, a time frame that has started to filter into other states as the official time Christmas decorations and in store Santa Claus start to appear) and is left up until it is taken down. Some traditions suggest that Christmas trees may be kept up until no later than 2 February, the feast of the Presentation of Jesus at the Temple (Candlemas), when the Christmas season effectively closes. Superstitions say that it is a bad sign if Christmas greenery is not removed by Candlemas Eve. The most commonly used species are fir (Abies), which have the benefit of not shedding their needles when they dry out, as well as retaining good foliage color and scent; but species in other genera are also used. European tradition prefers the open aspect of naturally grown, unsheared trees, while in North America (outside western areas where trees are often wild-harvested on public lands) there is a preference for close-sheared trees with denser foliage, but less space to hang decorations. In the past, Christmas trees were often harvested from wild forests, but now almost all are commercially grown on tree farms. Almost all Christmas trees in the United States are grown on Christmas tree farms where they are cut after about ten years of growth and new trees planted. According to the United States Department of Agriculture's agriculture census for 2007, 21,537 farms were producing conifers for the cut Christmas tree market in America, 5,717.09 square kilometres (1,412,724 acres) were planted in Christmas trees. Over the years, other styles of artificial Christmas trees have evolved and become popular. In 1930, the U.S.-based Addis Brush Company created the first artificial Christmas tree made from brush bristles. Another type of artificial tree is the aluminum Christmas tree, first manufactured in Chicago in 1958, and later in Manitowoc, Wisconsin, where the majority of the trees were produced. Most modern artificial Christmas trees are made from plastic recycled from used packaging materials, such as polyvinyl chloride (PVC). Approximately 10% of artificial Christmas trees are using virgin suspension PVC resin; despite being plastic most artificial trees are not recyclable or biodegradable. Other trends have developed in the early 2000s as well. Optical fiber Christmas trees come in two major varieties; one resembles a traditional Christmas tree. One Dallas-based company offers "holographic mylar" trees in many hues. Tree-shaped objects made from such materials as cardboard, glass, ceramic or other materials can be found in use as tabletop decorations. Upside-down artificial Christmas trees became popular for a short time and were originally introduced as a marketing gimmick; they allowed consumers to get closer to ornaments for sale in retail stores and opened up floor space for more products. Artificial trees became increasingly popular during the late 20th century. Users of artificial Christmas trees assert that they are more convenient, and, because they are reusable, much cheaper than their natural alternative. They are also considered much safer as natural trees can be a significant fire hazard. Between 2001 and 2007 artificial Christmas tree sales in the U.S. jumped from 7.3 million to 17.4 million. Live trees are typically grown as a crop and replanted in rotation after cutting, often providing suitable habitat for wildlife. Alternately, live trees can be donated to livestock farmers of such animals like goats who find that such trees uncontaminated by chemical additives are excellent fodder. In some cases management of Christmas tree crops can result in poor habitat since it sometimes involves heavy input of pesticides. Concerns have been raised about people cutting down old and rare conifers, such as the Keteleeria evelyniana, for Christmas trees. Real or cut trees are used only for a short time, but can be recycled and used as mulch, wildlife habitat, or used to prevent erosion. Real trees are carbon-neutral, they emit no more carbon dioxide by being cut down and disposed of than they absorb while growing. However, emissions can occur from farming activities and transportation. An independent life-cycle assessment study, conducted by a firm of experts in sustainable development, states that a natural tree will generate 3.1 kg (6.8 lb) of greenhouse gases every year (based on purchasing 5 km (3.1 miles) from home) whereas the artificial tree will produce 48.3 kg (106 lb) over its lifetime. Some people use living Christmas or potted trees for several seasons, providing a longer life cycle for each tree. Living Christmas trees can be purchased or rented from local market growers. Rentals are picked up after the holidays, while purchased trees can be planted by the owner after use or donated to local tree adoption or urban reforestation services. In 2006, the Seattle–Tacoma International Airport removed all of its Christmas trees in the middle of the night rather than allow a rabbi to put up a menorah near the largest tree display. Officials feared that one display would open the door for other religious displays, and, in 2007, they opted to display a grove of birches in polyethylene terephthalate snow rather than religious symbols or Christmas trees. In 2005, the city of Boston renamed the spruce tree used to decorate the Boston Common a "Holiday Tree" rather than a "Christmas Tree". The name change drew a poor response from the public and it was reversed after the city was threatened with several lawsuits. At the Bilbao airport 2005 displayed a Christmas tree and a Santa Claus and Christmas elf alongside the Basque Olentzero, as a way of syncretising traditions in Northern Spain. Chrismon trees are a variety developed in 1957 by a Lutheran laywoman in Virginia, as a specifically religious version appropriate for a church's Christmas celebrations, although most Christian churches continue to display the traditional Christmas tree in their sanctuaries during Christmastide.